Scorching sun rays were getting us blind in the afternoon of Friday, the 29th of April. We could have just stayed somewhere air conditioned place and chill. But we didn’t do that. 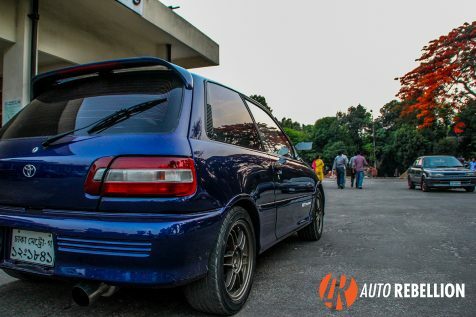 We went outdoor for something special, somewhere cooler than any other cool air filed room and it was the 2nd consecutive EP Owners’ Meet, 2016, held at Cantonment Railway Station. 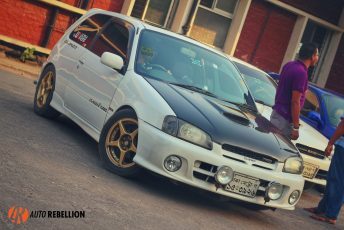 This particular event was organized by Adeeb Chowdhury for the second consecutive time, who he is a owner of a beautiful EP81 as well. People who are not into car things will have hard time to understand or guess what “EP” lies for. To put it in simple words, it’s a rocket which can be stored in pocket, if not then a little bigger place than a motorcycle parking space is required. Starlet is the subcompact (small) series of vehicles from the automobile giant Toyota. Toyota first started producing this particular series of cars back in 1973. It was known as Toyota Publica(KP40). It had variants of 2k (1Ltr) and 3k (1.2Ltr) engines. Later Toyota progressed with the introduction of 2nd gen Publica (KP60) in 1978. 4k engine was newest variant added then. KP series had FR layout. In 1984 Toyota introduced 3rd gen Publica as Toyota Starlet (EP70). This time old K series engine was replaced with more efficient E series engine and also FR layout was changed into FF layout. 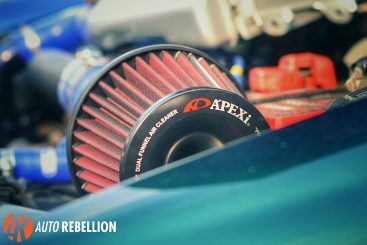 That was the first time Toyota introduced a forced induction engine the 2E-TELU in Turbo-R and Turbo-S models accompanied by TEMS (Toyota Electronic Modulated Suspension). Rest of the packs were came with 1E and 2E variants. The 4th gen Starlet(EP80) was introduced in 1989. GT Trubo(EP82) was equipped with advance 1.3Ltr 4E-FTE turbo charged engine pushing about 133 HP at 6300 RPM. Ridiculous amount of power in a small, light weight chassis was the focal point for the enthusiast to pick up and have fun with it. 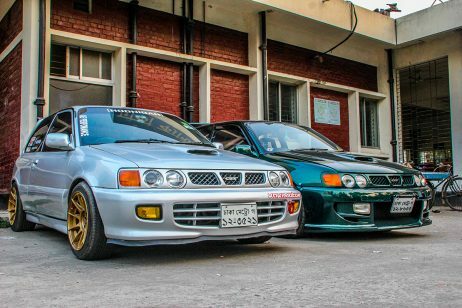 Lastly the 5th gen Starlet was came into being in 1996. Glanza V Turbo was the sports type equipped with 4E-FTE engine as well. 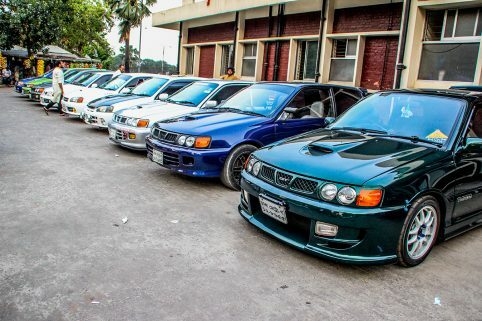 As we entered into the realm of the event, we got warmer as the EP81,82 and 92 Glanza line up greeted us warmly. Star of the pack was the bottle green pocket monster EP82 of Tanweer Zaman. He always throws a little element of surprise with every car he gets his hands laid on. Those white Work Emotion Kai was head turner nonetheless. 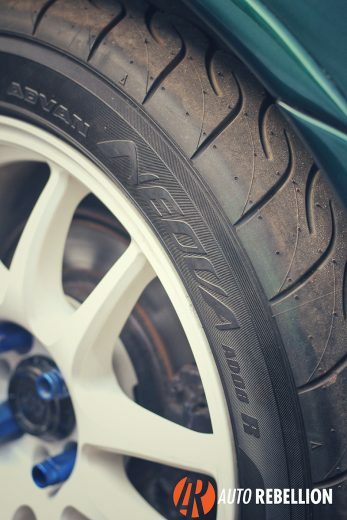 They were mated with Advan Neova AD08 tires. 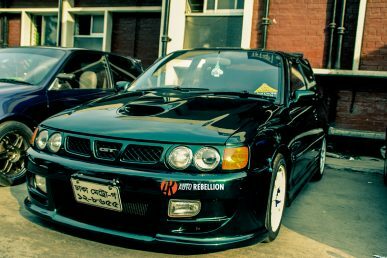 Toms’ front bumper and spoiler adds menacing look while maintaining soothing body line. Like old times he started EP82 project right from scratch. 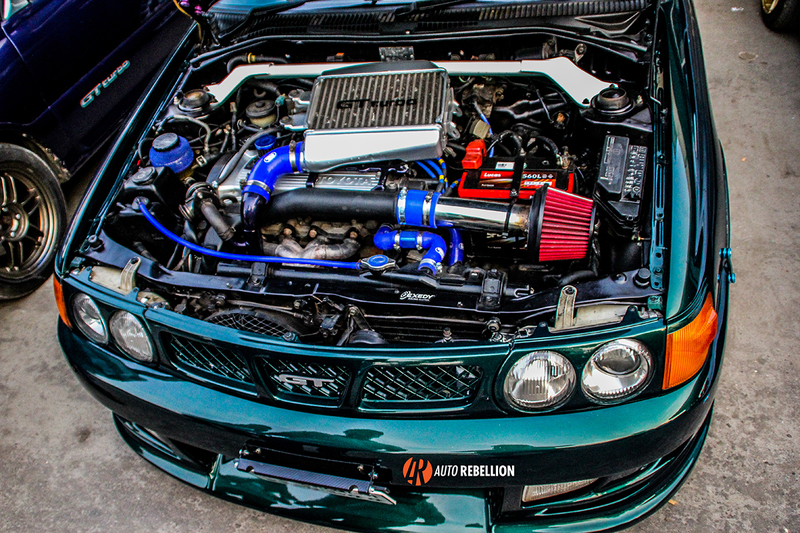 Under the hood it got 4E-FTE swap with lots of aftermarket performance parts. I mean LOTS of them! From the Hel Performance brake lines to top mounted intercooler from RX7 and Speed Vision Hybrid Turbo, almost everything got juiced up. 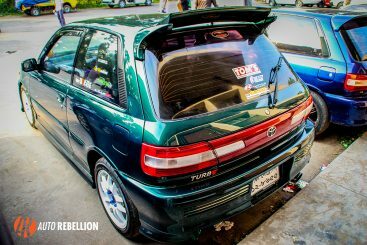 Zisco headers, Zisco downpipe, 5zigen exhaust, Greddy BOV, Ultra Racing front lower arm bar, Fensport light weight crank pulley and the list goes on and beyond. There was another EP82 bit of fat looking and nicely stanced out that caught eyes belonged to Onto Bhuiyan. 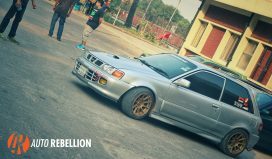 Lowered with TEIN springs and stood upon 8.5j rims and bit of tweak on the fenders added a different dimension to it. One of the EP82s had a very unique aftermarket accessory. The blue EP82 has original GT3 Carbon fiber side mirrors from Japan. 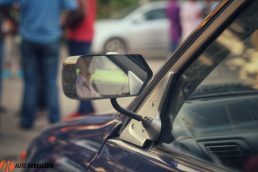 Apparently the owner mentioned that he got some body parts of the starlet from Japan and had got these mirrors attached to the doors. These GT3 carbon mirrors aren’t only for looks, apart from being carbon fiber. Their main purpose is to reduce the surface area against the wind as the car moves forward, to reduce aerodynamic drag. Moving on from the EP82 brothers, two Glanzas showed up. The Glanzas were the last generation of the Starlet GTs. 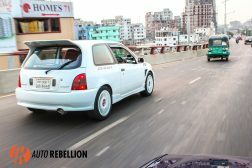 These two glanzas weren’t heavily modified like that of Tanweer Zaman and they looked like they were daily driven machines. THe EP8s looks much aggressive than Glanzas and starlet GT owners have mixed reviews on their performances. Some say the EP82s handle better than Glanzas whereas the Glanzas perform better than EP82s. One of the Glanzas had red aftermarket recaro seats which is a brilliant combo with white. 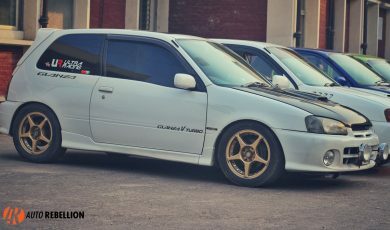 Both these Glanzas were very well maintained and were automatic.